Bright and gleaming windows – inside and out – make all the difference to the way your home or business looks. Clear, shiny windows will even boost your staff's morale and enhance work productivity. 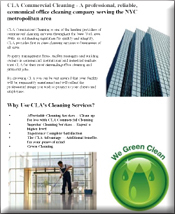 At CLA Commercial Cleaning, we can clean away the dirt and grime that accumulates in one of the busiest cities in the world, New York and its surrounding areas. It's time to let the natural light flood through your windows again. By using our window cleaning services on a regular basis you can maintain the professional appearance of your building and transform it into a comfortable and pleasant home or work environment. We can do rust removal too! No matter how high or how hard-to-reach your windows are, CLA Commercial Cleaning's bonded, insured and fully trained team of professionalswill leave your windows streak free, gleaming and squeaky clean. For all yourinterior and exterior commercialand residential window cleaning services, call CLA Commercial Cleaning at646-532-3750 our contact us line. We clean and maintain New York's, as well as its surrounding areas, residences, office and businesses. We offer floor waxing and finishing companies, stripping and refinishing, carpet cleaning,and janitorial, superintendent and porter service companies. in New York and the Tri-State area.